Yoga with a dancing bear? A giant roller coaster of kid yogis? Welcome to Yogapalooza! 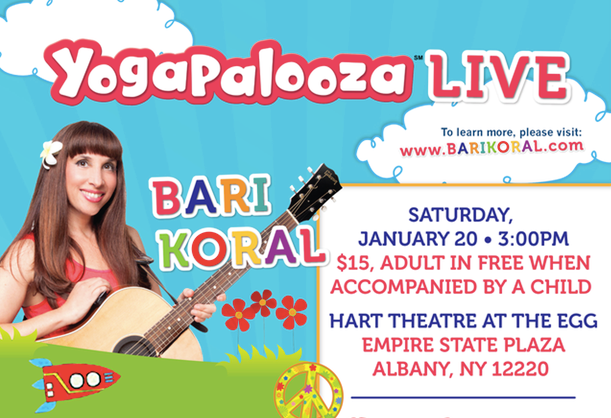 Based on the TV show created and hosted by Bari Koral, Yogapalooza is an interactive concert packed with yoga poses, songs, dance and play. We’ll take a trip to the moon, learn yoga with a gingerbread man, pop like popcorn, hang upside like bats and lots more as we stretch, play and rock out to Bari’s award-winning songs. Unroll your mat, put on your adventure caps and off we go! The most fun you’ve ever had doing yoga guaranteed! Beginners welcome. Click to learn more and get your tickets!